celebrities v. giant inflatable rats, the old lady who swallowed a fly edition. i know that counting haylie duff as a celebrity last month left the door open for some looser interpretations of rat, but i didn't think things would get this random this fast. the new office building next door is run by...rat catchers? or rats, until so recently that they couldn't call off the inflatable strike but did manage to substitute a superhero cat? 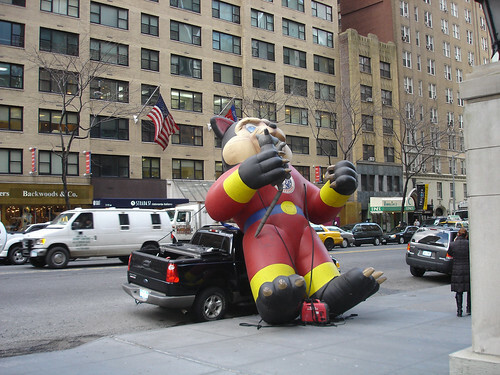 the whole "dissent via the macy's thanksgiving parade" genre confuses me. i need a nap. I pass a man-sized inflatable Cingular logo every day going to campus, but the other day it was deflated and drooping over the sidewalk. What category do I put it in, and how much does it count for? T: "what do we want? RUBY SLIPPERS! when do we want them? NOW!" P: it isn't labor-related, per se, but i for one protest cingular whenever possible...half a point to the rats. I was going to make a Lollypop Guild reference (adding diabetes-maintenance classes in the health plan, economic justice, etc. ), but I checked my swing. Well done, ma'am.